It is that time of year again. 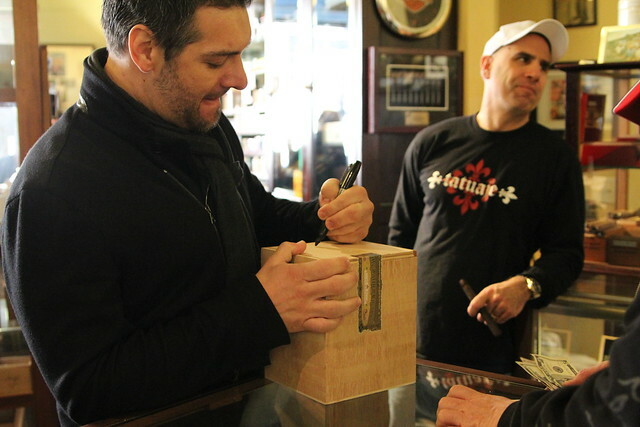 Pete Johnson of Tatuaje Cigars visits W.Curtis Draper and we talk about what to look forward to in 2011. I’m sure some of you have heard about some of the new releases he has planned for 2011 and hopefully this video gives you more details and puts some rumors to rest. Nothing like going to the source for the good word. What interview with Pete Johnson would be complete without a status update on the Monster Series? Pete seemed a little wishy washy with the answer he gave that the Monster might not happen this year. He had some reservation last year when I interviewed him but The Face still was released. This time around though, I really got the feeling that the Monster Series might actually be on a hiatus. In addition to that, a Saints and Sinners update, find out who Pete thinks deserves a kick in the nuts and what exactly is making him fat and gray? A quick production note. I shot this video using a new Canon 60D with a Tamron 28-75mm f2.8 lens on a tripod. Took a little getting use as I only played with the video features for like 5 minutes to do sound testing. Hopefully my wife lets me use it more as I’m all about consolidation. Anyway, thanks for watching. I hope you enjoy the video as it took some 22 takes to finally get the video with Pete “Troublemaker” Johnson. Last time I talked to Pete he told me that as I get older, I will inevitably get fatter as my head gets bigger. That dude cracks me up. Nice. Jerry#1 and Jerry #2 – ROFLMAO – That was awesome. Always great to hear from Pete about what is going on and getting it straight up. This morning, I have posted some opinions on this interview. In particular, Petes thoughts on the candela releases. Im a fan of Petes products, but I 100% disagree with him being upset of another candela release coming out after the Illusione one. I look forward to this interview every year. Great Job, both of you. Coop: I tend to agree with Pete on this. Whoever said the thing about Camacho Corojo in the video is spot on. Camacho was the first to make super strong cigars and coined the term corojo, now they are a dime a dozen. Is Pete copying Camacho? Yes, everyone is. It’s what the market demands, and if you don’t have the business sense to ride the trend, well you are missing the boat and won’t be in business very long. Wheter you are the first or not, it does not matter. I like Pete but I respectfully disagree with his statment. However, Casa Fernandez/ Racies Cubana is the one that makes the Illusione Candella and the Viaje Candella. Being that it is from the same factory and if I was Dion I would be a little upset but that’s what you get for not owning your own factories and fields. That is the stuff you have to deal with. Is it fair for Casa Fernandez/ Racies to sit on all the Candella wrapper just because one of their clients was the first? No, they are in the business of selling cigars, not sitting on tobacco. Besides, I think its the market is big enough to support the two of them and besides that the Viaje is a limited blend. Adam – that would be John Anderson, one of the owners of W.Curtis Draper. Lots of experience, great knowledge and one of the leaders on the IPCPR Board. Great interview, prob one of my favorites of Pete’s I have ever seen. And a lot of good news with more full release cigars coming out then limited stuff. Also interesting about the Saints and Sinners, will look into that. Props also to Pete and Candela and Dion, everybody needs to think this way. Not that nobody should do the same thing but let Dion bask in the sun a little first. What a great interview. I had no idea Pete Johnson was such a cool/down to earth kind of guy. He reminds me of a much cooler version on Seth Rogen. LOL @ Seth Rogen. Pete is a very cool dude to hangout with. Appreciate you watching and I’m happy you enjoyed. Doc!!!!! Do they have you deployed to some cave in Afghanistan? You were definitely missed bro. Hope you and the family are doing well. Such a great video, and that it’s informative on top of being funny is gravy. Pete needs his own reality show, possibly with Jerry in tow to record his off the cuff thoughts at different events. Thanks to Pete for taking the time to record these, and tolerating Stogie Review’s croc-sportin’ gnome! Great video!!! I agree with Pete on the factory being unethical. Dion probably could work out a contractual agreement but the cigars would cost more. What he might try is an option to buy more wrapper first before they sell to another. Hard to say. Great video and interview. Thanks for the info.